Behold, the nutty blue champions! It wasn’t quite palpable discord but there was a degree of grumbling at the Falkensteiner Schlosshotel on the banks of the shimmering Worthersee in the Austrian Alps last July. It wasn’t just the pre-match meals, although that was one issue of contention. 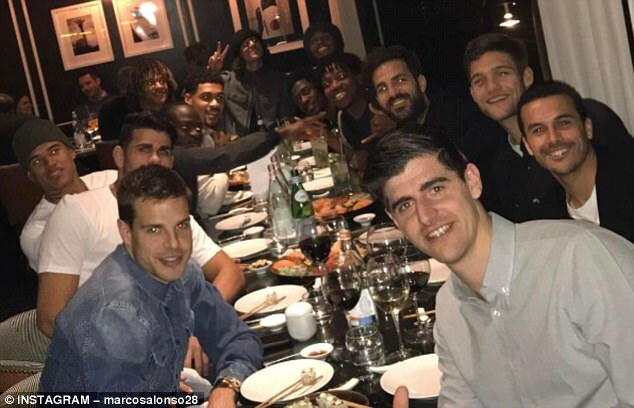 When the Chelsea players first entered the dining room before the Rapid Vienna friendly match, some had walked out on seeing the array of nuts, dried fruit and snacks. It wasn’t a rebellion. They just assumed they were in the wrong room and went searching for their usual scrambled egg, pizza and sandwiches. They were soon put right, but it wasn’t only the food. It was the intensity of the work. Not old-school running, but physical work with exercise balls and bands. Then came the video analysis. Everyone knows pre-season will be hard, but there was a level of intensity and then, later, tactical analysis which surprised even Chelsea players. ‘Obviously the impression in the beginning with the manager was that we were all going to do a lot of work,’ says Thibaut Courtois, and he stifles a chuckle. It is an impression which hasn’t really changed much. 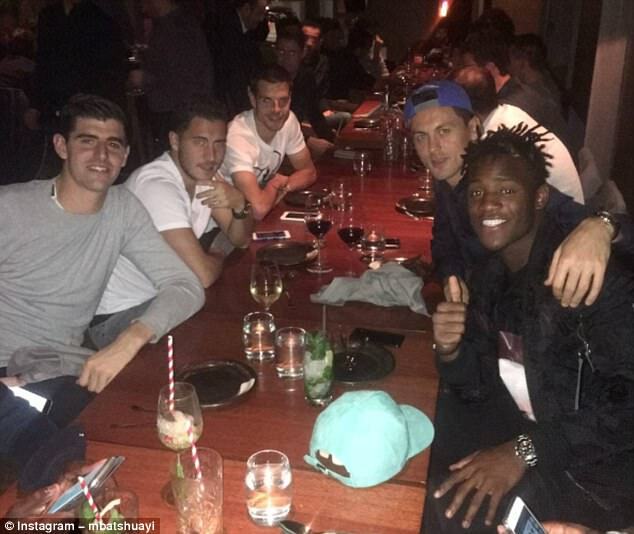 ‘There are lot of video meetings, obviously the things that a football player doesn’t like too much,’ added Courtois. 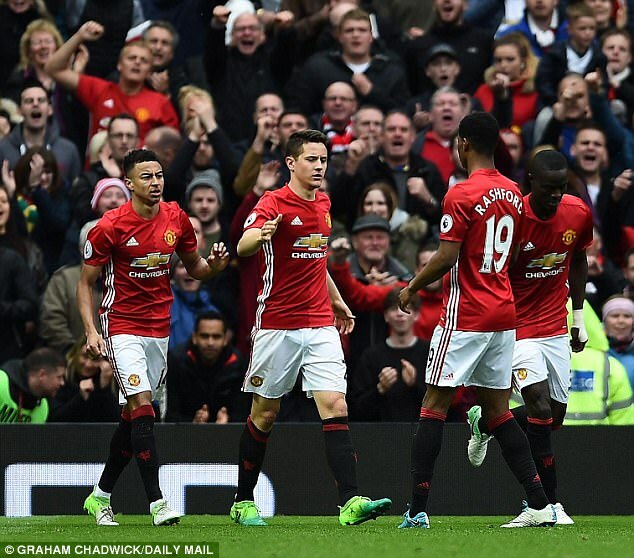 Bear in mind these are players well versed in the ways of Jose Mourinho, who made his name on the basis of the detail of his preparation, analysis and his teams’ fitness. Yet almost all the Chelsea players have reported that manager Antonio Conte stepped it up to another level. Despite this, pre-season in Austria seemed an inauspicious start. High in the stands of the US Bank Stadium, the impressive new $1billion home of the Minnesota Vikings in Minneapolis, it was all too easy to see the flaws in Conte’s plans last August. Sure, there were some positives to take: a few days previously they had been run ragged by Real Madrid in Michigan, two late goals from Eden Hazard flattering the side in a 3-2 defeat. At least here they had beaten AC Milan 3-1. That couldn’t disguise the glaring weakness. 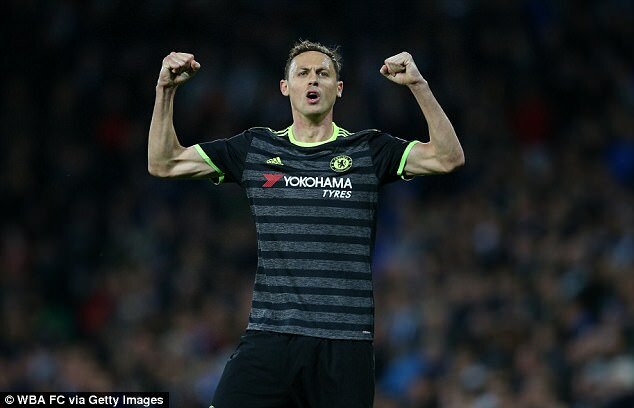 Chelsea had started with a back four of Ola Aina, John Terry, Gary Cahill and Cesar Azpilicueta. Kurt Zouma was working his way back to fitness. Branislav Ivanovic was on the bench, but, frankly, when he came on it wasn’t a huge improvement on the 19-year-old Aina: one had guile but no legs, the other, coltish exuberance but not enough know-how. Terry was the conundrum which had tortured Chelsea managers since 2013. Just one more season seemed to be the mantra – and it looked an ambitious one. Here was a team that desperately needed back-up. A right-back was imperative and perhaps two centre-halves. Certainly playing a back three seemed out of the question. It wasn’t just the defence, however. Conte was experimenting with what was almost a 4-2-4 formation, with Bertrand Traore and Diego Costa up front. Good luck with that in the Premier League. With the defenders they had, it seemed an open invitation to opponents. Few would have noticed in the UK. By the time the match finished it was the small hours of the morning in England, but there were only 10 days before the season started, 27 days before the transfer window closed. The transfers would come. August 31 saw a flurry of activity, but it was hardly overwhelming. Marcos Alonso, best remembered for his mediocrity at Bolton and Sunderland, joined from Fiorentina. David Luiz excited fans, if only for his iconic status, but he was 29, hardly famed for adding defensive stability and struggling to get in the Paris Saint-Germain side. These were not the first-choice, A-list signings. They looked like the make-do-and-mend list. 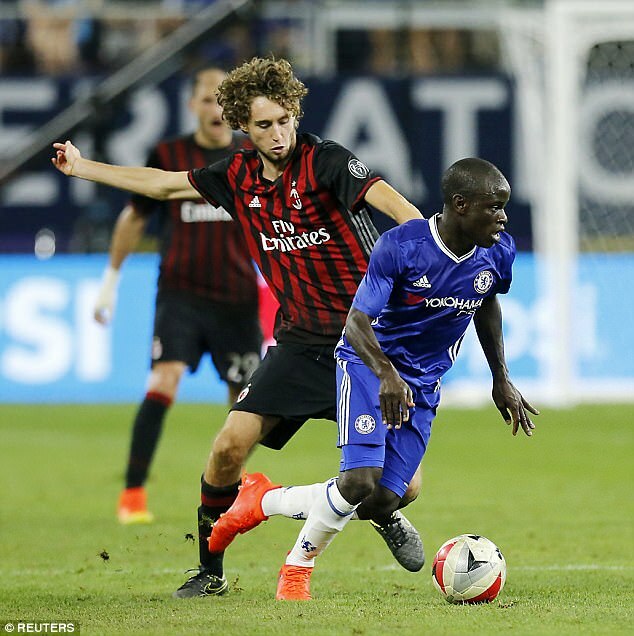 Michy Batshuayi and N’Golo Kante had arrived previously – the latter always looking a smart move – but Chelsea seemed to be short compared with their expensively-attired rivals. Still, wins followed at home to West Ham and Burnley and away at Watford. Maybe all would be well. Conte knew change was needed after Chelsea’s defence was completely dismantled in the first half. The Italian reverted to the 3-4-3 system that brought him success at Juventus. This tactical switch saw a renaissance in the matches that followed and led them to where they are now. 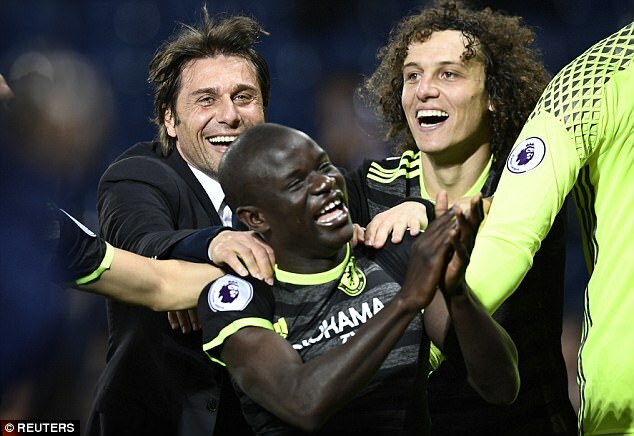 Chelsea moved seven points clear at the top of the League, bouncing back from the defeat against Tottenham that ended their 13-game winning run. 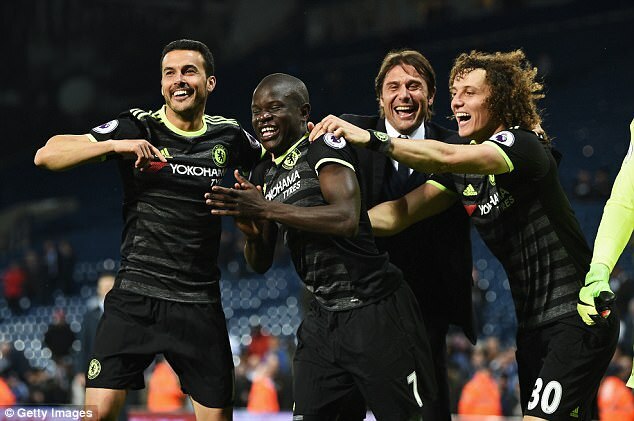 Conte proved he could win without leading goalscorer Diego Costa. He had been dropped after a training ground dispute over his fitness, amid reports he had been offered a lucrative transfer to China. Chelsea took a significant step closer to the title, going 13 points clear after Gary Cahill’s late goal gave them a hard-fought victory. Even the absence of Eden Hazard with a muscle problem did not thwart Chelsea. Conte’s side had now won 20 of their past 23 matches in all competitions. In this FA Cup semi-final, Conte’s team selection raised eyebrows and led to suggestions he was prioritising the Premier League title race. Belgian outcast Michy Batshuayi was given a rare outing on a big occasion while Costa and Hazard were on the bench. When they came on in the second half with Cesc Fabregas it showed the strength of Chelsea’s squad ran deeper than Tottenham’s. This was the defining game. It took Chelsea a big step nearer to clinching the title and planning a parade. 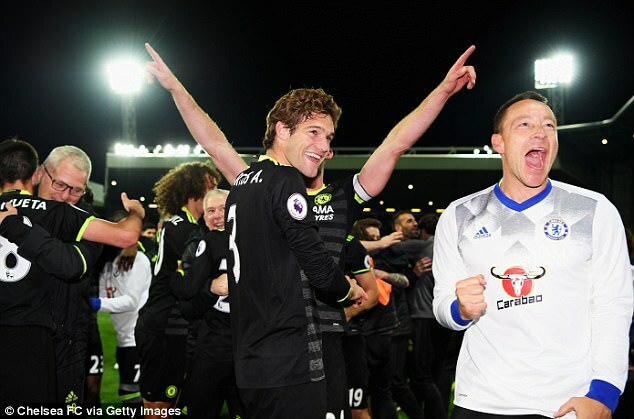 This victory meant they could drop three points in their remaining four games and still claim a second title in three years, even if Spurs won all of their remaining fixtures. 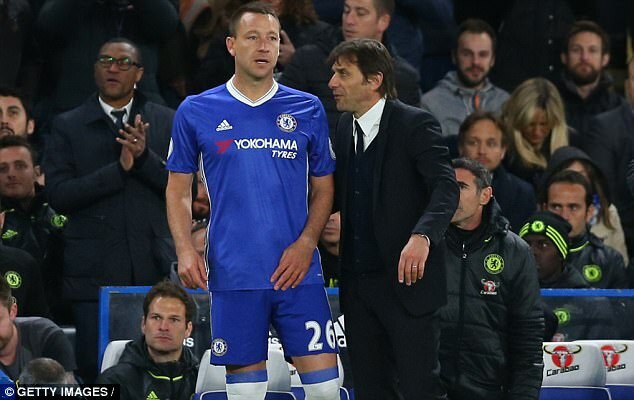 At Chelsea, they say there is only one thing worse than when the manager stops talking to the owner, and that is when the owner stops talking to the manager. Even so, there is no surer sign that the team are in crisis than when Roman Abramovich is a frequent visitor to the training ground at Cobham. In the last week of September he was there a lot. 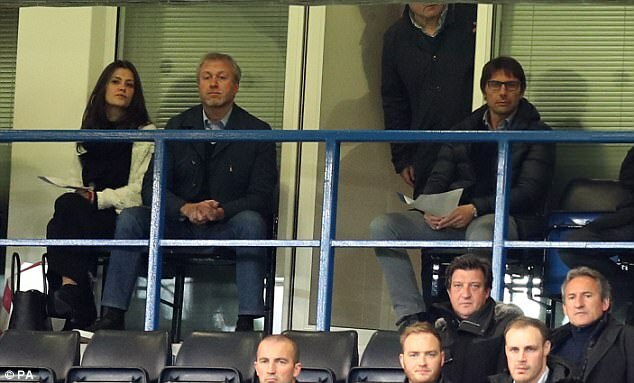 On the plus side, he was at least talking to Conte, along with directors Marina Granovskaia and Michael Emenalo, the firewall between the owner and the manager. Conte was explaining how this side, harried off the pitch at Stamford Bridge against Liverpool, had now capitulated to Arsenal. The ultimate soft-centred team had outfought Chelsea, outplayed them. It was like a role reversal of the past 10 years. Conte looked ashen-faced when he came into the press conference that day. He said all the right words, but you suspected none of them would make any difference. Maybe the 10th place of the previous season wasn’t the aberration? Perhaps the team needed extensive rebuilding? Conte talked the owner through the planned change to a back three. He had almost perfected the system at Juventus and with the Italian national team, but there he had Giorgio Chiellini, Leonardo Bonucci and Andrea Barzagli. It was that week the tactical work kicked in at Cobham. Slowly, Conte walked his defenders through the system. Victor Moses had never played wing back, Azpilcueta had never played in a back three. When Conte strolled over to make small talk and say hello to Chelsea TV staff in his first few days of training, they weren’t overly surprised. Pleasant though it was to be valued, every new manager tries to make an impression. When it was still happening some months later, the manager had made an impact, as he had on most of the staff at the club. It is not just the now well-told story of attending the staff Christmas party and spending two hours there rather than just recording a video message, as is normal. He will go out of his way to sit down with staff in the canteen, to make time to talk. There was the pre-season barbecue for team and families, which set the tone. Every six weeks, there is a team meal for players and coaching staff. At Christmas, there was a family day out at the Flip Out trampoline park at Wandsworth. 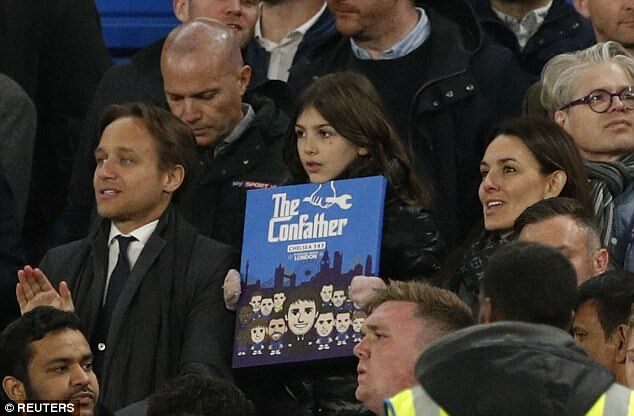 Such events can be hard for Conte. His own nine-year-old daughter, Valentina, and his wife, Elisabetta, have remained in Italy this season. Though frequent visitors, it was felt his first year would be too intense for the whole family to move, with Antonio so focused on work. 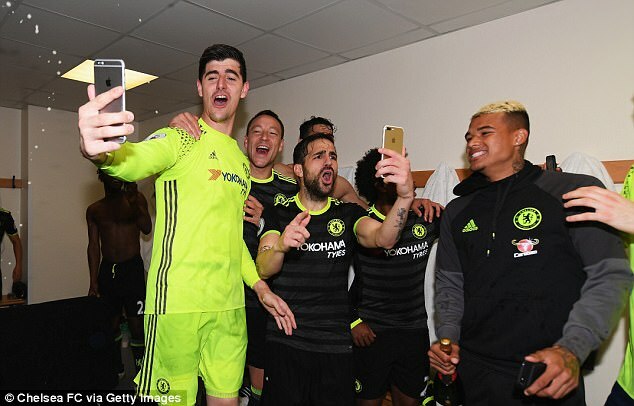 They are constantly on FaceTime and are moving to his Chelsea home this summer. 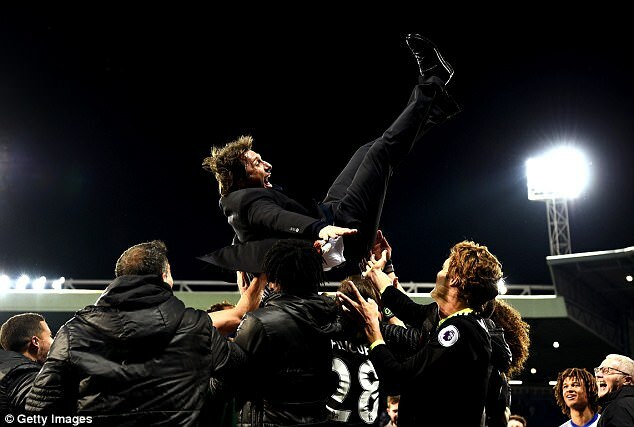 Conte needs to turn on the charm at times, for he is hard on his players. There is no cosy chat when a star is dropped. The team is simply announced and the player can deal with it as he will. Conte is old-school Italian in that regard. He will happily make time for any player who is disaffected. His door is open but it is the player, not the manager, who has to take the initiative. He warned staff that although he would be normal through the week, he was a different beast on match-day. Whereas Mourinho would spend time in his office before the match watching TV, confident the work had been done during the week, Conte paces the dressing room. If he sees a player, a thought will dart into his head and he’ll remind him of his duties. However Conte has had to compromise. He has found it hard to cope with the traditional English dressing-room culture of music blaring in the run-up to kick-off. Conte is used to the silence and intensity of the Italian way, but he has let it pass and he delivers his instructions against a background of booming grime or funk carioca. 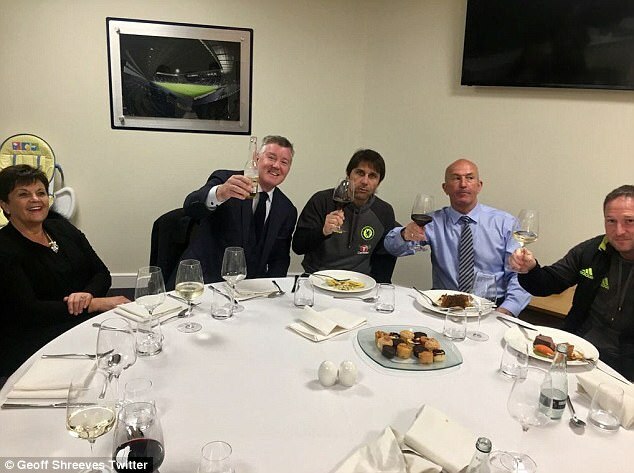 Post match, he is intrigued by the tradition of sharing wine with the opposition managers and their assistants. Coaches who have been needling him through the 90 minutes, objecting to his histrionics, are suddenly civil. Again, it isn’t the Italian way. He is more used to remaining at war, before and after games, but Conte now takes time to greet each manager an hour or so before the game and speak to them then as well. 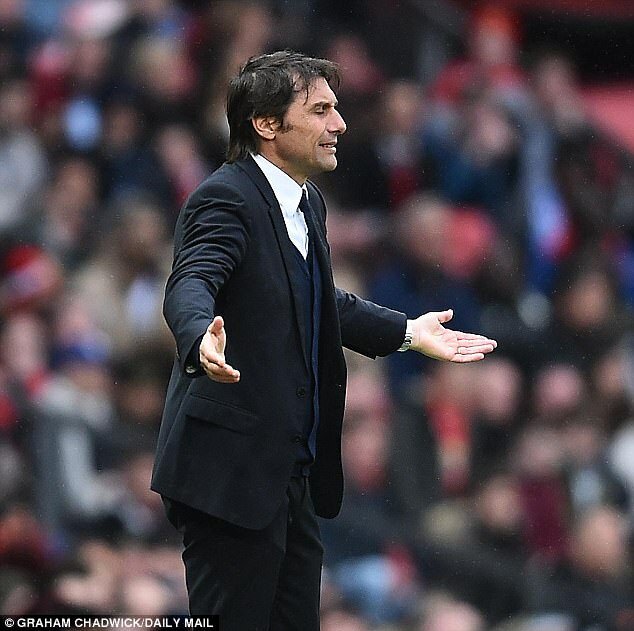 Defeat at Arsenal worried Conte, but it at least precipitated their 13-match winning run and a change of formation which provided the foundation for the title victory, but there was an even worse moment, according to Chelsea insiders. It came just four weeks ago at Manchester United. Conte was shocked by the 2-0 defeat, or rather by the limp performance of his team. He was genuinely concerned that they had lost focus. The next week in training the new rules were imposed: no visitors at the training ground, no one outside the squad in the canteen. 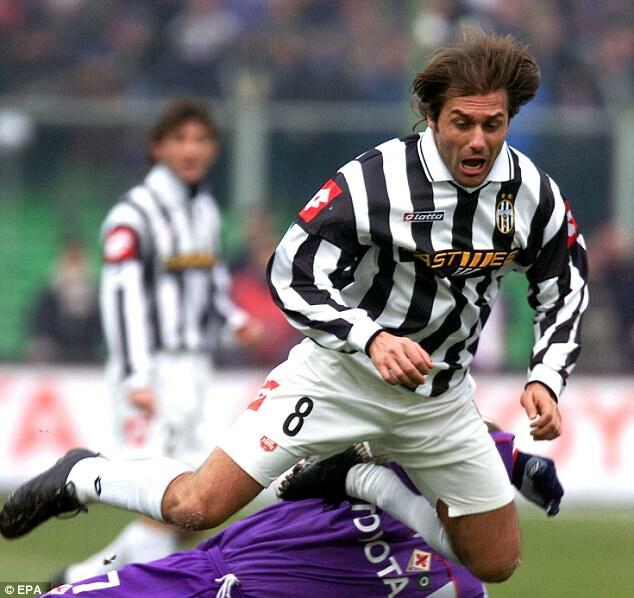 He explained why – he had been part of a Juventus team that had thrown away a title when they were nine points clear with eight games to go in 2000. It caused him months of insomnia. He wasn’t about to let it happen again. Interestingly, Mourinho had done precisely the opposite in 2014-15. Then the manager’s strategy was to make the last few weeks of training as light-hearted as possible. It was a bluff. Mourinho felt his team were stumbling over the line but he wanted to convince them he wasn’t worried. Conte was happy for them to know he was concerned. It is why, when the annals of the season are written, the eight-day period when they beat Tottenham in the FA Cup semi-final, defeated a Southampton team coming off 10 days’ rest and won at Everton, who had won eight consecutive games at Goodison Park, will be viewed as when the title was won. ‘I cannot describe how he was on the dressing room afterwards,’ says Willian of his manager. He is talking outside the dressing room at the Hawthorns on Friday night and the title had been won. 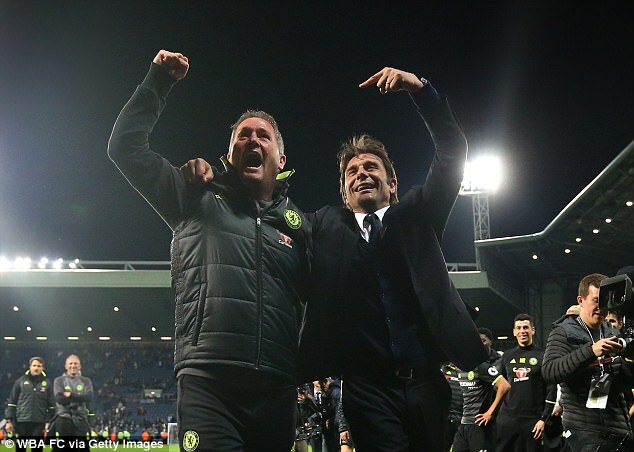 The implication is either that he dare not, or that Conte’s excitement went beyond words. That would appear to sum up Conte. Somehow he has combined the steeliness a modern-day coach needs in disciplining his team with a humanity that convinces the players he is (almost) one of them. When Mourinho was sacked in December 2015, Emenalo had spoken of the ‘palpable discord’ between team and manager. Chelsea and Emenalo regretted that. It became the definitive assessment of Mourinho and this team. The club insist that Emenalo was actually talking about a disconnect between the football the team wanted to play and the restrictions Mourinho had imposed on them. 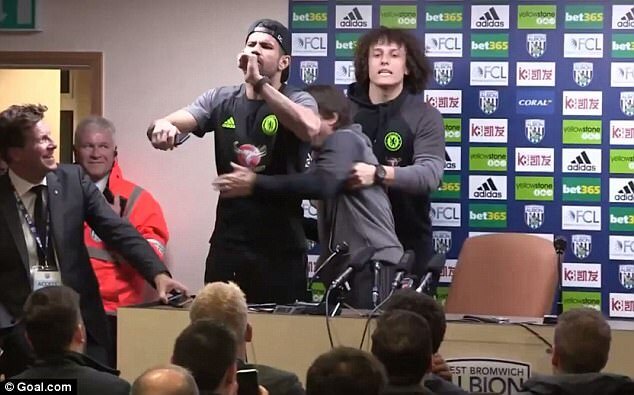 Luiz and Costa noisily bundled Conte out of his post-match press conference on Friday at West Brom. The clock was approaching midnight, a party awaited and the players were impatient. Their kidnap was humorous rather than insubordinate and just within the bounds of acceptability. There was no discord – other than in wanting to get away to celebrate – just comradeship. Yet Conte freed himself from his players and returned to finish speaking to writers, while Luiz muttered like a frustrated schoolboy and Costa gooned around with a fire extinguisher. Conte is that excitable, that charismatic, that he can’t expect total subordination from his players. Yet he remains in charge and he knows what is necessary. The party could wait, there were duties to fulfil. Once done though, you suspect another side of Conte’s personality was unleashed. That has perhaps been his outstanding quality this season. He has emphatically imposed himself on this team, but he hasn’t crushed their spirit.